Kaja at work in his office, examining a mechanical bank. Kaja Veilleux, the 67-year-old owner of Thomaston Place Auction Galleries in Thomaston, Maine, started buying and selling “stuff” at the age of eight. He worked as a cashier in his grandfather’s grocery store in Waterville, Maine, where he became interested in the coins he was handling. He asked his grandfather if he could take some and was allowed to as long as he replaced them with other money. His grandfather often went to yard sales; Veilleux went along and started buying things himself. By the time he was 12, he was selling to local dealers, by 14 he was going to auctions, and by 18, he was doing antiques shows. Then he bought a nice primitive still life painting for $80 and sold it for $250 and decided it was what he wanted to do. When he was 20, he was married, had a child and lived in a one-room apartment. He was out buying and selling 18 hours a day and loved it. 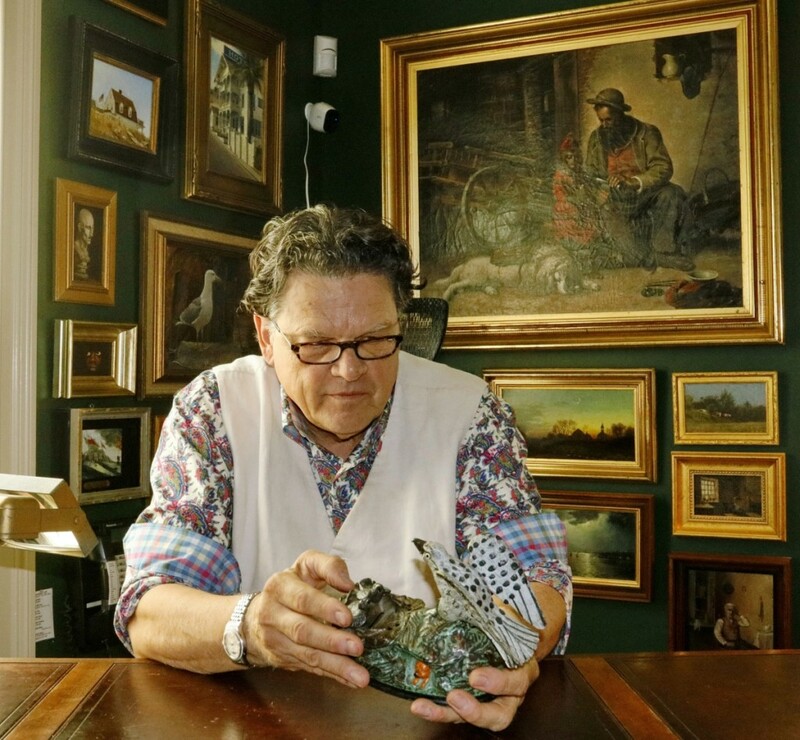 The business he built is now the largest auction house in Maine, grossing $7-8 million annually. Has Jim Julia’s retirement affected your business? It’s making a huge difference. We’re getting even more house calls than we did before. People call and say, “we used to do business with Julia but since he’s retired, we’d like to talk to you.” To take advantage of these opportunities, I knew that I had to make some changes. Along with John Botero, my vice president, we hired a chief operating officer, a chief financial officer, revamped our marketing department and made other staff changes. We remodeled the gallery to give us more space and to enable us to improve our use of new technologies. We’re starting to do online-only sales and will do more. My intention – with the staff changes – was to free myself and John from much of the day-to-day running of the business and give us more time to be out meeting people and getting quality consignments. That’s what I do best, and now I have the time to be out more. And John is building a real estate department for us. What was it like in the early years? I didn’t like school and had little formal education. My kids are the first in our family to go to college. Working for my grandfather, who was always buying and selling something, was a great experience. Then I worked for an art supply store in Waterville (Maine), learning about paintings and sculpture and developed a good eye. I was going to three or four auctions a week, buying whatever looked good and peddling to other dealers and collectors. I eventually had a warehouse full of stuff in Skowhegan (Maine), and around 1982, I restored a great old five-story building in the center of Newcastle (Maine) and opened an antique shop. I was also conducting auctions, and in 1994, I bought the property in Thomaston, which is now the home of my business. held here by a nephew, will be included in the August 25–26 sale. What are some of the things that have worked for you? John Botero and I do charity and benefit sales for numerous organizations, including the Owl’s Head Museum. We meet hundreds of people through these events. The other thing we do that has been successful for us is the weekly free appraisal day. Great stuff comes in that way and much of it, sooner or later, winds up in our sales. What are some of your fond memories? Number one would have to be the most valuable house call I’ve ever had. Fifteen years ago, a woman called about a highboy she wanted to sell. I went, the highboy was okay, but the woman’s daughter, Cali, was fantastic. It took a little while before we started dating, but we married 12 years ago. That was my best house call. For things I’ve sold, I’d mention an incredible sampler I sold in 2009 for $465,000. It came in on a free appraisal day in a brown paper bag. The most expensive lot that I’ve sold was a fireboard and matching overmantel that brought $605,000. I found them stored behind a furnace on a house call in Yarmouth, Maine. Those are the kinds of stories I’ll always remember. You have an exceptional sale coming up August 25-26? Yes. It’s probably the best sale I’ve ever had. We have incredible paintings from an estate in Coral Gables, Fla. There are seven Milton Avery paintings that were given (to the seller) by the artist, who was often a guest in the Florida home. 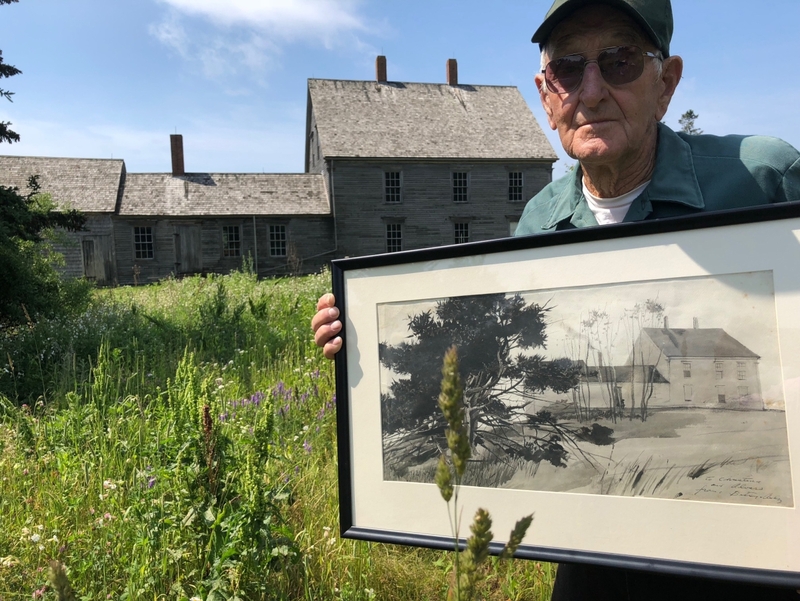 There are works by Bernard Buffet, Jamie Wyeth and Andrew Wyeth, including the last one Andrew did at the Olson farmhouse. It’s going to be an amazing sale.